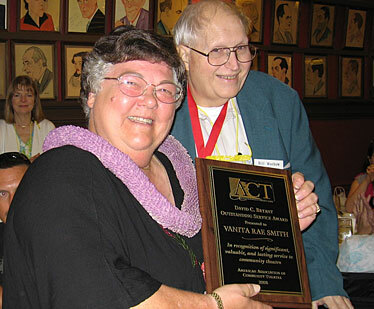 Vanita Rae Smith, longtime producer-director of Hawaii's Army Community Theatre, received the David C. Bryant Outstanding Service Award from the American Association of Community Theatres at a recent awards luncheon at Sardi's in New York. The award was presented to Vanita by Bill Muchow, right, for her "significant, valuable and lasting service to community theatre in America." Waimanalo's Clayton Makalii won Oceanic Time Warner Cable's My Island Home Phone "Give Us a Jingle" contest. The victory was worth a $1,500 gift card from Best Buy and five years of free My Island Home Phone service. Second place went to Kaimi Brede and third to Sean Donahue. Clayton's winning lyrics start out with: "My Island Home Phone, you can call me anytime, My Island Home Phone, a month it's $19.95, with caller ID and your name on my TV, From Oceanic Time Warner Cable for me ... "